Electromagnetic field strength meter allows testing of the power reaching your packaging. The AM-CSM-4 accurately measures the cumulative electromagnetic field strength of an Induction Sealer. 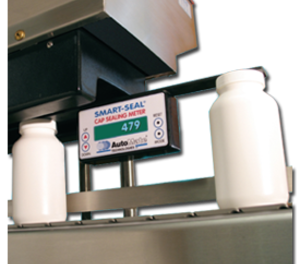 This electronic meter verifies that the induction sealer is producing a consistent and repeatable sealing field every time. The digital display provides analytical data to assist in validation, documentation and quality assurance. Unit is powered by (2) N-size 1.5volt batteries. CALIBRATION: This unit is calibrated to standards maintained at the Auto-Mate Technologies test lab to allow for the finest precision. It should be re-calibrated every 12 months. Refer to the calibration label on the unit for the calibration due date. For calibration, return the unit to Auto-Mate Technologies at the 34 Hinda Blvd. address. Ship the unit with a written purchase order for calibration along with a check for $97.00 U.S. This fee covers calibration and new batteries. Shipping charges additional.